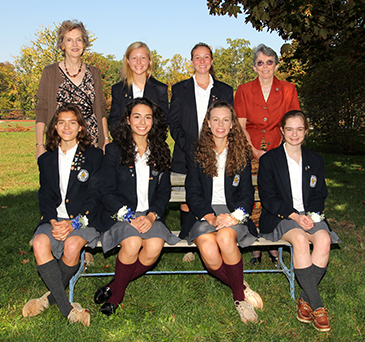 Academy of the Holy Angels is proud to announce this year’s winners of the Sister Mary Nonna Dunphy Scholarships. These partial scholarships, named for the foundress of Holy Angels, are open to students in the 10-12th grades, and are based on academic excellence, leadership, character, service and an interview with the scholarship committee. The recipients are pictured above with AHA Principal Miss Jennifer Moran and S. Patricia Murphy, President of Holy Angels. Standing between them, L to R: Kelly Mandella (Montvale) and Erin McNamara (Wyckoff). Seated L to R: Lydon Kersting (Park Ridge), Adrianna Bergstein (Tenafly), Fiona Williams (Glen Rock) and Anne Haws (Rivervale).